Products - Welcome to Lamppost Farm! Lamppost Farm continues to raise premium quality meat from animals that live flourishing lives. To make this happen, we are committed to purchasing non-GMO feed for our chickens and pigs! And, our beef are fed a diet of 100% grass forages. ﻿1. Supreme product that excels in contributing to consumer health, provides real flavors from meat not from additives, and is ONLY meat from our animals . . . no growth hormones, no dietary supplements, no added water. 2. Small farms trade volume for relationship. By design, we know our animals and their specific needs. At Lamppost Farm, you have the opportunity to know the animal and the story behind the meat you eat. Knowing at this level adds significant and tangible value to your food by providing a low stress environment, custom care, and constant improvement to farm practices. 3. Our prices reflect the real costs of raising these animals. We are not subsidized. Our price margins enable us to continue providing these products in a way that brings you, the consumer, closer into relationship with the Grower of all things . . . "For one plants and one waters, but it is God who causes all things to grow." 1 Corinthians 3:7. 4. We want to change "normal". We want people to recognize that the standard for healthy, high-quality, and flourishing meat is meat like what we raise at Lamppost Farm. Anything cheaper is discounted for a reason. There is a cost to these discounts, which usually does not show up till later. - Pastured Broiler C﻿hick﻿en: fresh or frozen. - Pastured Great White Turkey: the cream of the flock! - 100 % Grass-fed Beef: premium steaks, roasts, ground beef, and more. - Pastured Pork: the ultimate bacon experience. Click on the links for detailed information. Our herd of cattle is made up of a few registered Devons and Devon-Cross cattle. 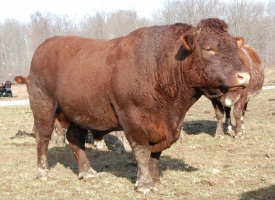 We often have full blood registered bulls and Devon-Cross heifers and cows for sale. We delight in our cross of Berkshire and Hereford pigs. We often have breeding stock and feeder pigs for sale. Call or email for availability and prices.